Dear friends, today Fynsy Team prepared a new fashion game for you! 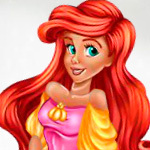 You'll be in a role of a personal photographer of modern princess Ariel. It will be really a Great Photo Session! So, she will pose in beauty, home, sport styles and even like a scene queen. Choose the best photos and make new article about Ariel's New Look with the exclusive pictures by the best photographer! Enjoy!This is an ad free game.